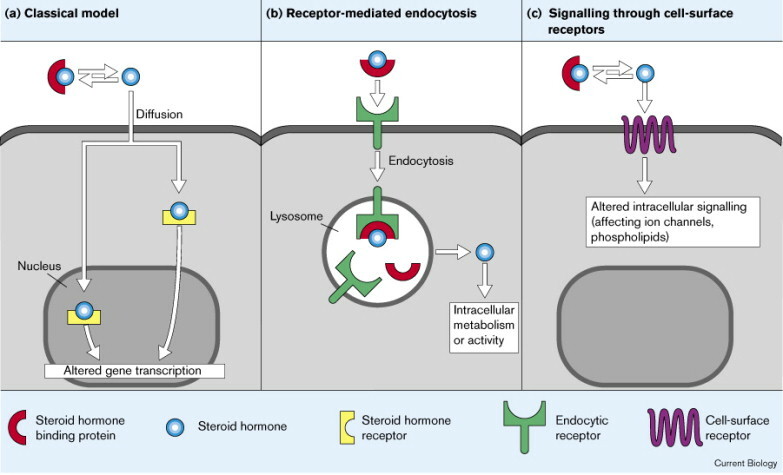 The image below is from the article Steroid hormones: Interactions with membrane-bound receptors. It shows three ways that a steroid hormone (drug) can interact with a cell. (a) The classical model. The steroid hormone dissociates from its plasma carrier protein and diffuses across the cell membrane. After gaining entry to the cell, the free hormone binds to an intracellular receptor and alters gene transcription. (b) Receptor-mediated endocytosis. The steroid hormone, bound to its plasma carrier protein, is brought into the cell via a cell-surface receptor. The complex is broken down inside the lysosome, and free steroid hormone diffuses into the cell, where it subsequently exerts its action at the genomic level or undergoes metabolism. (c) Signalling through cell-surface receptors. The free steroid hormone alters intracellular signalling by binding to cell-surface receptors. The steroid hormone could exert these effects directly or could alter signalling by blocking the actions of peptide hormones.